PRESS RELEASE 9th SEPTEMBER 2007 by the Rotary Club of Epping. Scillonians are well aware that William and Tricia Thomas give generously of their time and talents at Chapel, Choral Society and ‘The Entertainers’. They also give up every Saturday evening during the holiday season to raise money for charities in Uganda and Romania. When regular Island visitor and Rotarian Duncan Whitehouse asked them if they would come to Epping to sing for charity, they found a way of making it possible. Their son, Nathan, was leaving Heathrow Airport on September 4th on a round-world expedition and so they were able to visit Epping for a concert on 5th September. The concert was a huge success. Female members of the audience thrilled to the warm baritone of William’s voice, and everyone was charmed by the love-duets he sang with Tricia. 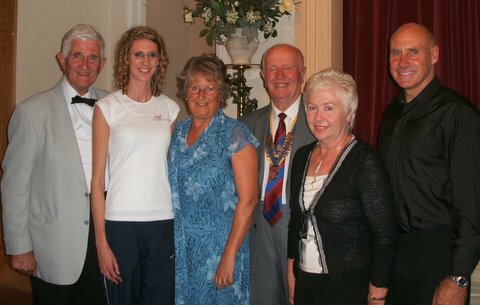 A Flautist, a harpist, a pianist and a cellist supported them in the programme and locals Duncan Whitehouse and Des Slade, both Rotarians, provided comic acts as variety. At the end of the evening, Rotary President Alan Kerr presented a cheque for £1500 to Joanne Ryan, an aspiring Olympian sprinter. At 20 years of age, she is already winning gold medals at county standard and has represented England twice already at track events. She hopes to compete in the 2012 Olympics, but gets no government support to offset her extensive training expenses. She works at a children’s nursery in the morning and spends every afternoon training for her chosen events. Joanne gave a graceful speech of thanks for her gift and to all the people who have contributed to her success. She also gave thanks on behalf of the English Flood Victims Appeal, which will receive a similar cheque from the event proceeds – this being part of an appeal which is being co-ordinated by Rotary on a national basis. Thanks to William and Tricia for their generosity!